Mike, Raph and Don enjoy a peaceful night out camping. Mike and Don wish Leo could have joined them, but Raph is actually happy to get a break from the guy. Mikey suggests someone tell a ghost story and Don spins a yarn about Dudleytown. Apparently, it was a small town not far from their campsite. The people there began to change over time and became nocturnal, living in caves. At night, they would attack people from nearby towns until eventually those townspeople fought back. They locked up all the people of Dudleytown in a church and left them there as their valley was flooded to become a reservoir for Boston. The next morning, the Turtles go out to a field to play some baseball, waving to a few hikers as they pass by (and still getting used to the idea of living out in the open as “aliens”). Raph hits a fastball into the woods and Mikey runs out to get it. He’s attacked in the woods by a pair of strange fish-like man-creatures. When he doesn’t return, Don and Raph go looking for him and follow the trail they left behind. 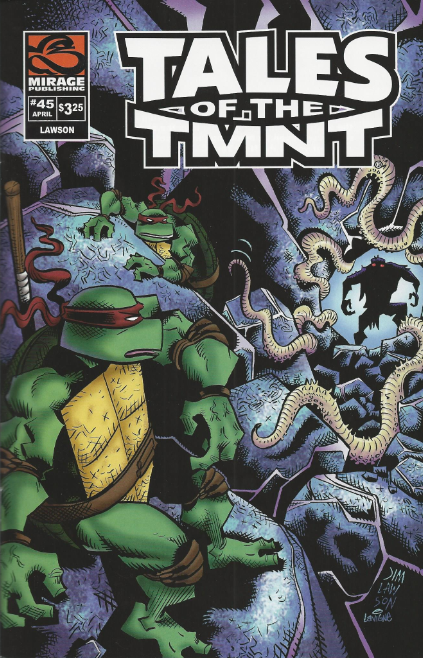 Eventually, one of the man-creatures attacks them and Raph stays behind to fight it while Don continues tracking Mikey. After a skirmish, Raph kills the creature and leaves to catch up with Don. Mikey, meanwhile, is carried down a cave by the other man-creature and is set before a huge Lovecraftian monster; a lesser god named Karenthog Sar Routolo, Devourer of Worlds. The monster says that it has lived in the earth, listening to the rocks tell their stories for centuries. For every lie man tells, every promise man breaks and every act of violence man commits, the rocks crack. It has been listening to these cracks and knows that soon, man will be crushed under the weight of his evil and in that catastrophe, Karenthog will rise. It says that Michelangelo intrigues it, as Mikey is not a man but lives like one anyway. The monster intends to devour Mikey and learn his secrets. Donatello takes this opportunity to come out of hiding and attack the monster, giving Mikey the chance to run. The remaining man-creature gives chase, but as Don and Mikey cross the threshold to the surface, Raph pushes a boulder down from above which crushes the man-creature and seals the entrance. Mikey thanks his brothers for coming to his rescue, but Raph tells him not to sweat it. He promises that he and his brothers will always be there for each other. As he says this, a rock begins to crack. *This story takes place during the six month time gap in TMNT (Vol. 4) #5, after the Utroms had initiated First Contact with Earth. *The crack in the rock foreshadows the Turtles breaking up and going their separate ways in the future. You can read more on that in this article. *The global catastrophe the subterranean monster fears was previously alluded to in Tales of the TMNT (Vol. 2) #16, Tales of the TMNT (Vol. 2) #18, Tales of the TMNT (Vol. 2) #24, and Tales of the TMNT (Vol. 2) #30. *The global catastrophe itself will be shown in detail in Tales of the TMNT (Vol. 2) #69. *This issue also contained a bonus pin-up, “Alhazred” by Kennon James. 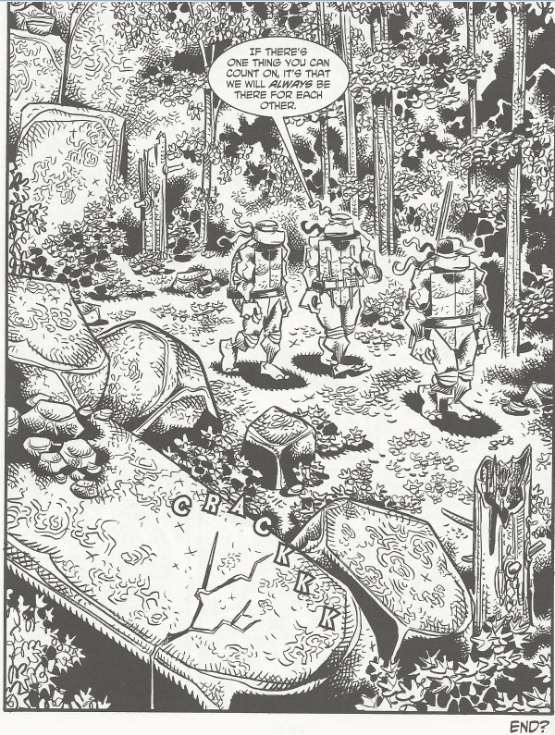 When you go back and reread the Mirage TMNT stories, particularly Tales of the TMNT Volume 2, you’ll notice several vague allusions to a great global catastrophe that will wipe out human civilization. What’s interesting is that few of these predictions were exactly the same and it’s easy to overlook them all when reading through the first time around; it’s something you better pick up on in hindsight. I think the earliest hint of the global catastrophe was in TMNT (Vol. 1) #37 (“Twilight of the Ring”), where Leonardo defeats a spiritual entity known as the Adversary and inexplicably ensures the downfall of human/mammalian civilization. This was a “guest” issue and as such it may or may not “count” on a canonical level (that’s really up to the reader, though). But be that as it may, it fits in nicely with all the other stories that tease the end of the world. 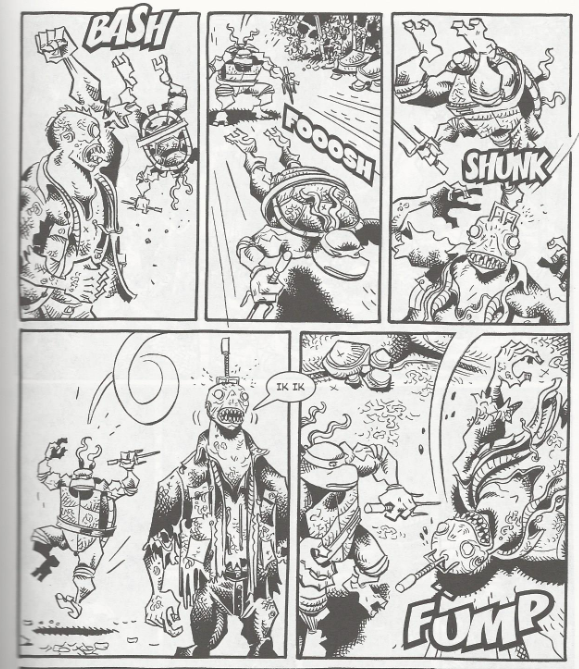 Tales of the TMNT Volume 2 was where the writers really began building up to the Apocalypse. Murphy wrote two stories (“Sins of the Past” and “The Blue Hole”) that suggested global warming would very soon destroy the Earth. In both stories, the threat of global warming was the impetus for another adventure and it’s easy to forget all about it by the time you’re done reading. Murphy wrote another story ("Rock of Ages”) where survivors of an ancient human race are discovered by the Turtles and it is learned that they destroyed their civilization through over-industrialization which led to a global climate change. So again, the global warming thing. Other writers took a more supernatural look at the potential destruction of Earth. In a story by Bill Moulage that better complements this one (“Circle of Darkness”), Michelangelo encounters a Lovecraftian monster named Ouroboros and a cursed prophet named Tiresias. Tiresias foresees a catastrophe that will kill tens of thousands of people and tries to cast a spell that will bind those lost souls to Ouroboros. That works well with the Lovecraftian deity seen here in Lawson’s story (“Rocks”), which also foresees a future where mankind is crushed under the weight of his lies and arrogance, as for every lie man tells the rocks proceed to crack and crumble. It’s a bit poetic, but essentially the more mankind abuses the environment and ignores the consequences, the more they will bring about their own destruction (global warming, again). Whether you agree with the global warming sentiment or not (it was laid on way too thick for my tastes), it IS interesting how subtly they built the event up. You even saw glimpses of it in stories like Tales of the TMNT (Vol. 2) #55, which showed a flooded Earth and ruined cities. By the time you get to Tales of the TMNT (Vol. 2) #69, and you get to see the big event, hopefully all that foreshadowing will have paid off. Another element of foreshadowing seen in this issue is the inevitable dissolution of the Turtles as a team and possibly even as a family. We’d seen hints of their breakup as far back as “Old Times”, so again, anybody who has been reading the grand scheme of Mirage comics won’t be too surprised by the time they get here. But Lawson actually bookends this issue with hints of the breakup. 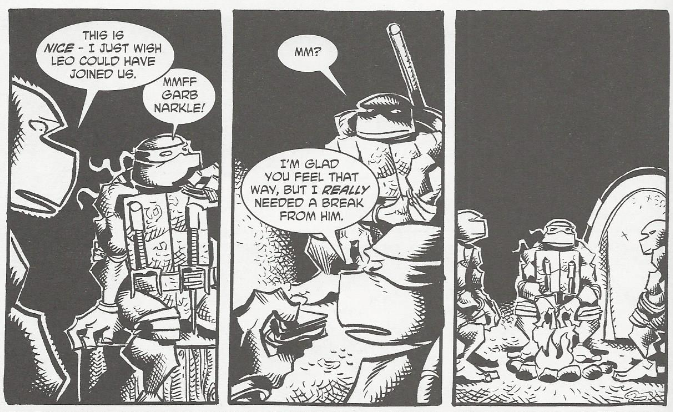 When the tale begins, the Turtles are one ninja short, and while Don and Mike miss having Leo among them, Raph makes a flippant remark about wanting to have a break from the guy (which leads to a panel of awkward silence). And, of course, the end of the story sees Raph make a remark about family unity, only for a rock to crack at the sound of his “lie” (illustrating that Raph’s earlier statement about wanting a break from his family was the truth, not his later remark about always being there for his brothers). All in all, that’s what “Rocks” really amounts to; lots and lots of foreshadowing for things to come. The meat of the story is really dull, just the Turtles fighting monsters, and I remember being bored with it the first time I read it. I guess in order to appreciate “Rocks” you need to step back and look at the big picture, which can be a little tough when you consider how episodic most of the storytelling in the Mirage series is. I hated Rocks for the fact that it's not one of those clever or subtle "Loveletter to Lovecraft" stories, but it's super heavy-handed. If the story could hold a brick, it would be hitting you in the head each page, shouting each time it hit you with "THIS! IS! A! LOVECRAFT! REFERENCE! DO! YOU! GET! IT!?" I mean, I get it. Lovecraft is influential, Lovecraft is awesome. I love the actual Lovecraft stories. I am totally okay with stories that use Lovecraftian references and myths if written well. But when you ejaculate Lovecraft on every page, you lose me. Even IDW'S Infestation 2 handled it much better, despite being an entire story about "Lovecraft's works invade IDW stories".